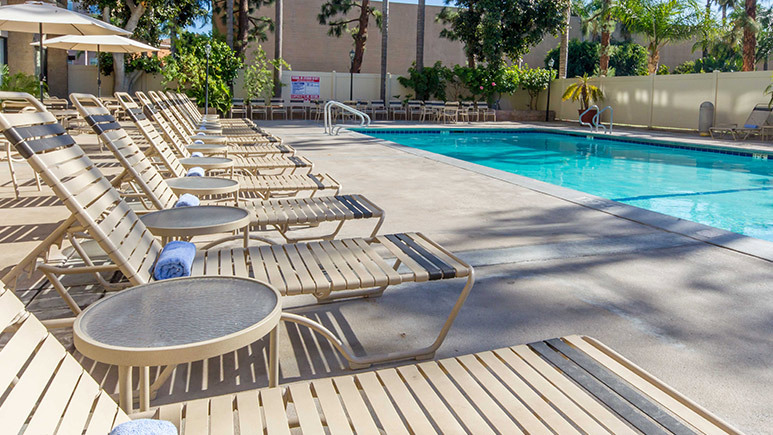 Located a ½ mile from the DISNEYLAND® Resort entrance, this full-service hotel is all about value! Enjoy newly renovated rooms, a great outdoor pool, sports lounge with happy hours and a fun, casual on-site restaurant. 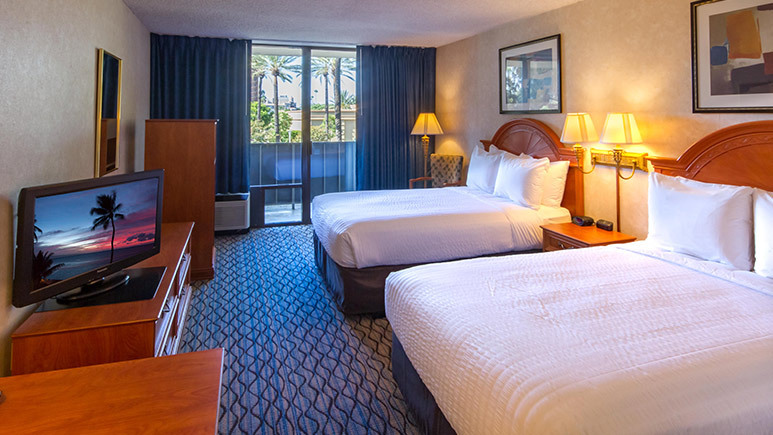 Rooms come equipped with a mini-refrigerator, and studio suites are available for a little more elbow room-and greater value-during your Disney vacation. Free full breakfast. Kids 12 and under eat free - limit one child free per paying adult entrée for lunch and dinner. We loved this hotel! Our expectations weren’t high whatsoever after reading some reviews, but we were pleasantly surprised with the quality of things during our stay. The rooms aren’t anything fancy, but they were nice and comfortable and I wasn’t grossed out by anything. The hardest part was not having a microwave, but the fridge was there at least. Rooms were spacious and beds were so comfortable. There’s even a nice little balcony with a pretty view. They had a nice crib for our baby and he loved it and slept great each night. Breakfast was awesome and they had a ton of options! (yogurt, fruit, eggs, bacon, sausage, biscuits and gravy, toast, bagels, juice, and tons of things!) This saved us for the mornings before going to Disneyland! There’s also the option to eat at the Palm restaurant that’s in the hotel as well, where 1 kid ate free with 1 paying adult, so that was nice too. The food was good and my kids and husband liked their meals! I wasnt a fan of what I got, but overall it was great and I’d be willing to try something else off their menu. I saw complaints about the shuttle and I’ll agree the shuttle from the Clarion isn’t the best, but the Marriot is no more than a 2 min walk away and we just took that ART shuttle majority of the time! (Took ART shuttle 3 to and from Clarion to Disneyland or shuttle 4&5 to and from Marriot & Disneyland.) They run often and we were able to get to and from easily! We just bought the 3 day bus passes at the hotel, they have a kiosk so it’s super easy! We were also able to print out our Get Away Today vouchers for our Disneyland tickets JUST IN CASE I needed it at the park. I didn’t, thankfully the mobile option worked just fine. But I wanted to make sure I covered all our bases to have a smooth first trip. The staff was really friendly and great. We were able to check in early and Ilana was amazing and kind to us. Staff was extremely helpful and answered all my questions that I had as it was our first family vacation and I had a lot of questions.. That’s why I’m leaving a long detailed review in case there’s one person wishing they had all this info as I did as I was searching! All went smoothly and we look forward to returning for many more family vacations in the future! This is a good, affordable option for people going to Disneyland! It’s clean and quiet. The breakfast buffet each morning was a lifesaver for us and allowed us to have a good breakfast before going over to the park. We would stay here again. We stayed at the Clarion Hotel over Veteren's Day weekend. The hotel was busy, but the staff was excellent and made us feel like we were VIPs. Our room wasn't anything fancy, but we didn't stay here for a hotel vacation. It was close to Disneyland and our kids loved the breakfast every day. Stayed here while my husband was attending a convention. We didn’t have our kids. I rode the ART shuttle to the park. First time I’ve been to Disneyland on my own and i have to say it was pretty nice. The hotel offered a free breakfast (not for everyone I noticed, it was something just through Get Away Today). The staff was so friendly. You can tell they love Get Away Today guests- I didn’t have to pay parking or a resort fee and the lady behind me was ticked she had to. Pleasantly surprised by this value hotel. I stayed in a family suite in June 2018. I was nervous about staying at a this hotel because the reviews were either good or really bad. I booked this hotel for the price and location. It’s across the street from Toy story parking lot and the shuttle was extremely convenient! We arrived in the Anaheim area earlier than planned. I called to see if we could possibly check in early. The front desk employee was very friendly and checked quickly if there was a room ready for us, There was and she said it would be no problem to come early (which was nice because some hotels get VERY annoyed if asked to check in early). Every employee we talked to was very friendly and helpful. We had no problems with our room and I was surprised how spacious and decent it actually was. The bathroom was a little dated and small but clean and served it’s purpose. Beds were clean and comfortable. The pool area is small as are most hotels close to the convention center, but it was good enough. Free parking and free breakfast for booking with Get Away Today was REALLY nice and saved us quite a bit on money. The breakfast buffet was great and had a lot of options. I have nothing bad to say about this hotel and would stay again! We stayed at the Clarion 5-6 years ago and it was horrible. We booked again to give it another chance after reading some reviews. It was a total difference. Our room was clean and enjoyable. The food was great - Jamie was awesome. The staff was so polite this time. We loved the change. Started our stay here with amazing customer service that just kind of went down as the days went by. Housekeeping at one point only left us 3 towels, 2 hand towels, 1 washcloth (our first day was fully stocked with 6 towels, 4 hand towels, 4 washcloths - all of which we used and put on the floor for replacing). When we called to ask for more, we were questioned as to why we needed more. Just a little frustrating. The room overall was nice, great view of the fireworks. Bathrooms are far outdated. Good luck getting your shower water to stay consistent. It would go from freezing cold to scorching hot back and forth several times during the shower - not a huge deal, but if you have little ones, definitely be careful with the shower. Called down to the lobby on our last night to ask for a do not disturb sign as there wasn't one in our room. We were told we could go down to the front desk and pick one up because there was nobody there to bring us one. After 12+ hours at CA Adventure, the last thing any of us wanted to do was go back downstairs. I created my own and stuck it in the key card slot. We also asked for a late checkout and were informed that he couldn't do it and we'd have to call back in the morning to ask the front desk - the whole point of requesting a late checkout was so we could sleep in. It all worked out in the morning and they happily gave us a 1 hour extension on the checkout time. Breakfast was good. Overall this was a good stay...but it definitely won't be my first choice in the future. Great customer service and kindly and quickly accommodated our family's needs. Great cafe, staff, location and room. One suggestion - have microwaves in the rooms or near the vending area. Other than that, excellent! We will be back for sure. Hannah was amazing. She helped us check in and was very, very friendly. She was so helpful and made our vacation even better. For the price, it's OK! 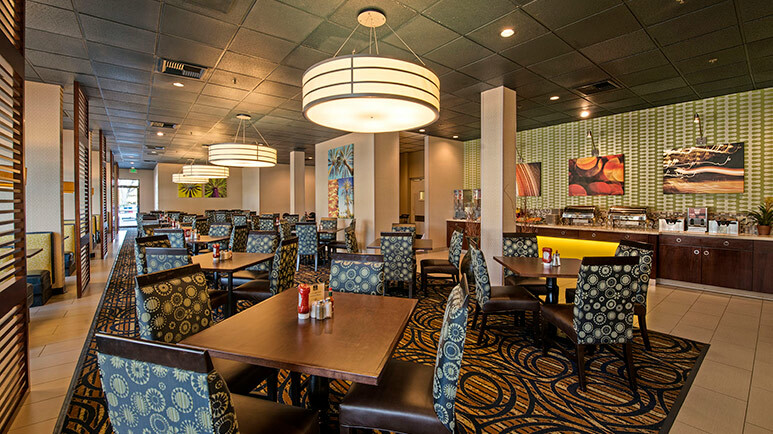 The good: The breakfast buffet has lots of options and has different items daily, each room has a safe, and it is within walking distance of Disneyland. The bad: There are only 3 tables in the restaurant that will seat more than 4 people,and they make you wait to be seated, so you need to get there early or arrive a little later if you travel with a family and don't want to wait forever to eat breakfast. The housekeeping staff doesn't speak English, so you will need to contact the front desk if you need anything. The rooms didn't look renovated, everything looked like it was built in the 70's and 80's except for the very small flatscreen TV. There was mold all over the tub in my room, and the tile was cracked. Only 2 ice machines work. They only had 6 TV channels that worked, and blamed the other ones that weren't working on the TV provider. The beds are super small and don't fit 2 adults, so my wife and I had to share beds with our kids. If you are driving, you'll want to get the package that includes parking because it is really expensive. We enjoyed our 4 night stay! The hotel is very dated, could definitely use some rehab. The water pressure in our room on the 9th floor (which we could watch fireworks from!!) had such low water pressure that I had to fill the tub to get the soap out of my hair. The rooms were clean, the staff was friendly, the pool was nice, the breakfast was amazing and the breakfast staff was hands down the best. One of the gentleman (Jimé I think was his name 🤔) was outstanding! He remembered us each day and made us feel like family. Beds were okay comfort wise. The one on the left was VERY squeaky and our AC fan was going out and made a pretty awful noise. Not a huge deal as we weren’t in the room other than to sleep. Overall great budget style hotel! We enjoyed our entire stay at the Clarion. The staff is extremely polite, friendly and helpful. Breakfast was delightful. Would certainly stay again! Hotel price excellent, 3rd night free, great hot breakfast buffet. Staff super nice and helpful. Second time staying at this hotel and would definitely stay again. Room quality rating of a 4 due to small bathroom. This hotel is a bit older, front desk staff was a bit rude at check in but it did not spoil our stay. Breakfast buffet was good and waiters was friendly and attentive to our requests. For the amount of time spent in room it was worth the cost. Staff available to us when we had questions. Gift shop worker was very helpful and gave us suggested times to get on the road to avoid rust out traffic. Would definitely stay here again. Looking forward to next time!!! Excellent service, great, clean room. The staff was pleasant and helpful. Will stay again. The Clarion had excellent service and friendly staff. The rooms were clean and comfortable. We had a great time at the Clarion Hotel. Jaime in the breakfast restaurant provided excellent service. It was a pleasure for us to have him be our waiter. A big thank you to Jaime! We had a great time at the Clarion. Everything was perfect for our vacation. The personel were especially friendly and helpful. Jaime makes excellent chocolate milk. We just returned from a great weeklong stay at the Clarion Hotel. The staff was great. Jesus was our waiter at breakfast a few times and we really loved him. He took such good care of us. My two main feedbacks would be to update the bathrooms and have ice machines on each floor. We will definitely consider staying here the next time we are at Disneyland. We had the best week long stay at the Clarion. The staff was great. Jesus was our waiter during breakfast a few times. We really loved him. He took such great care of us. The two main things that could have been better would be to have updated bathrooms and an ice machine on every floor. I had 4 adults and 2 kids in the studio suite and was perfect. I loved having the hot breakfast and free parking. It eas great being walking distance to the park. The staff were all friendly and helpful. I recommend staying here if you're on a budget. You wont be sorry. We had a fantastic stay. Everyone was helpful and kind. Service was wonderful. We especially appreciated the friendliness of the restaurant workers - Jesus :). They made the start of each day extra good. Thank you!! Will stay here next time! 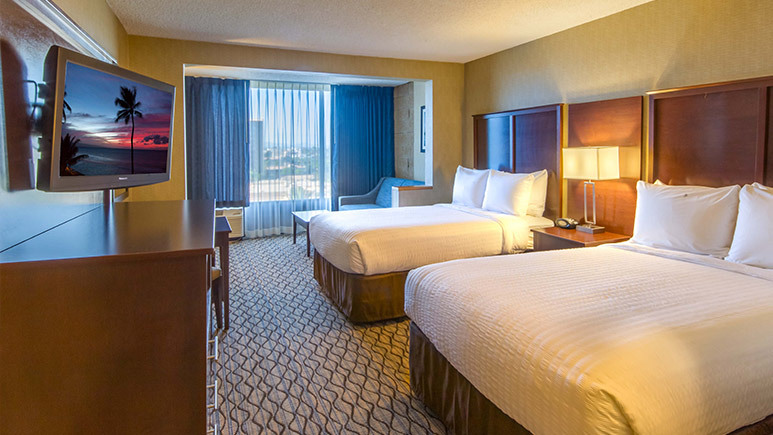 The room was very clean, the staff was very nice and helpful. The free breakfast was always delicious also. The beds weren't as comfy as I had hoped and the bathroom could use a an overhaul. Other than that everything was great and only a 15 minute walk to disney. The location was great, close vacinity to the toy story parking lot that we utilized to get to the park. Walking was too far with a toddler. I was concerned with reviews of unclean rooms, ours was clean and no areas of concern. The reason for not giving five stars is the breakfast situation. We were unable to bring food back to our room to eat. Typically on previous trips we bring food back for our kids to eat so theyre not sitting in a restaurant style setting. One person showers while the others eat. With our breakfast package the ENTIRE party had to be present to go downstairs to eat. This was an annoyance as my daughter wakes up at 530 am. NOBODY else wants to go downstairs for breakfast at that hour. For this very reason I will not be able to stay at this hotel again. Staff is attentive, and courteous. Was okay. Probably wouldn't stay here again though. The staff was great. We got there on a Sunday and they put us on the 9th floor in room that was not very big. Definitely not the "family suite" that I imagines. We went to visit some other people from our party an their room was so spacious, and they only had 3 people in their room. We had 6. So we asked for a different room and they put us in a more spacious room right away. I really didn't have a problem with our new room until I opened up one of the dresser drawers and there was a cockroach scurrying around in there. Totally grossed out and it escaped the drawer before I could catch it and flush it down. The breakfast was was great everyday and the breakfast staff was wonderful. We stayed at this hotel recently. So it's not a 5-star resort but for the price and the amount of time we spent it was a good buy. The staff was friendly and addressed any needs. When booking with Get Away Today you get free breakfast, that is a deal in itself, saved money on food. Free parking, walking distance to CVS and Walgreens and a lot of other shops around the area. We took a bus to Disneyland throughout our stay. The bus drops you off in front of Disneyland so it saves the feet. My family and I went to enjoy Disneyland and we did, the room was to rest up for the next day and it worked out. I would've rated this a 5 however, the 1st morning we woke up there was no hot water and we had to have cold showers. Also, the free breakfast was not great.... hard toast & French toast, soggy oatmeal, horrible sausage. My son loved the waffles.. the only thing my husband and I could stomach was the subpar eggs and bacon. My family and I really liked this hotel. We had the large studio room with two beds and a sofa bed. Perfect for us four adults. The hotel package came with free parking and free hot breakfast, which was great. Close to Walgreens and CVS. Found a short cut to the hotel using Hotel Way off of Katella, this is helpful when the cars start piling up to go to the Disneyland Toy Story Parking across from the hotel. To get to Disneyland, I suggest walking across the street to the Toy Story parking lot and catching the free Disneyland shuttles to the park. I gave the hotel four stars because the bathroom needs some updating. I would definitely stay here again. Just note that the hotel is right next to the convention center and I am not sure how busy things get when there is a big convention going on. The sleeping portion of the rooms was newly renovated, quite spacious and clean. The bathroom had obviously not been renovated for 30+ years, but was clean. The hallways were worn and the other common areas showed their age. The breakfast buffet was pretty bad - overcooked and bland food. The pastries were stale, but the cut fruit was fresh. We did not use the pool, but peaked at it and it looked clean and adequately sized. Overall, it was a great value for the price we paid. The ART shuttle stop was right outside and was on a short route to the park. Other hotels we have stayed in took 30+ minutes to and/or from the park. This one only took 5-10 minutes each way depending on lights. I was excited to be getting such a "great deal" by staying here! Unfortunately it is so run down and so dirty! In addition, I felt like my room smelt like a Hospital! (yuck) There was so much dirt and dust built up it made me feel gross. We ended up leaving a day early because I couldn't stand it. In addition, the breakfast was not good and a majority of their plates were dirty. I know for the low price I shouldn't expect much. However, I have stayed at other hotels, paid less and have been a lot cleaner and friendlier! I would not recommend this place to any of my friends and family and I will definitely not stay here again! save yourself and book elsewhere! Great customer service and really close to Disneyland! I'll start with the positives: The staff was friendly and helpful and the lobby was clean and up to date. I liked the area where the hotel was located by the convention center. It was an easy walk to Disney for the adults in our party but might be a bit far with little ones. Negatives: The room was not very clean at all. The air conditioner made noise and leaked water on the floor. The hotel was advertised as recently updated, but it was not. Or maybe I got the only room that was never done. Run don't walk away from this hotel! Don't fall for the newly renovated tag line, it's far from the truth! The bathroom was disgusting. While it had a new granite counter top, that was about all that was new. There was mold in the corners. The bathtub had 1970's tile that had been re caulked over so many time I cut myself on the excess caulking. We got a room that with the roof out our window. Kids in the hotel were running on the roof all night right outside our window making it impossible to sleep! Beds were very uncomfortable. The only plus was the staff was nice and it's a 15-minute walk to Disneryland. Great Location, close to Dinseyland and a good assortment of restaurants nearby. ART picks up right in front of hotel and drops you off at Disneyland. When you book with getaway today you get free breakfast and free parking. Breakfast was good and provided a number of options. Parking spaces were small and made it difficult to park when it was busy. Hotel room was decent size, bathroom was tiny and hard to maneuver in. Good size frigde in room. Overall we liked the hotel and would stay there again. When we arrived at the hotel, the room was dirty and a main light didn't work. I called the front desk and they said someone would be right up. It took 2 and a half hours to resolve this issue. Then, later that evening when we went to pull out the sofa bed we saw that it was dirty also and hadn't been changed. Again, I had to call the front desk and have someone sent up. It was very frustrating and took some of our time away from doimg what we had planned. Other than that, the hotel was great. I would still probably give them another chance next time. The rooms of this hotel are adequate -- we don't spend much time at the hotel, other than sleeping and getting ready for the day. The breakfast is quite good -- good service from the staff, good food on the buffet -- a good breakfast makes it so we don't spend as much on food at the Parks. I also like the free parking. The ART Transit is good -- you can take the bus that picks up right in front of the hotel on Convention Way or you can grab either of the buses that stop by the Marriott and Hilton just a few 100 yards away or grab the bus on Harbor Blvd -- or, the hotel is also close enough to walk to and from the park if desired (about 3/4 mile). The room was a little dated, but the staff was very helpful and friendly. My husband having a lung disease, it was great for me that they are a Disneyland good neighbor hotel and had transportation to the park. The best part of our stay was that they offer a full breakfast buffet that was open later than most hotels, instead of just a continental breakfast. Our trip was too short to take advantage of the amenities, however we did note that the grounds were kept clean and well maintained. I stayed at The Clarion with my 3 teenage boys and brother. We booked a studio suite which had two doble beds and a sofa bed, all side by side. The site stated that the hotel was refurbished but he room was old and out of date. The bathroom was extremely small and had a 80's feel. The hallway outside the room was hot, stuffy and had an odd odor. Staff was mediocre. Housekeeping was horrid! We never came back to a room that was cleaned well with made beds. The breakfast was decent and the restaurant staff was very kind. That and the cute souvenir shop were the only redeeming qualities to this "hotel". We had free parking for our car, however everytime we needed to leave the hotel we would get stuck at the gate because it would ask for payment. We would have to park, go back into the hotel to guest services and get a new ticket to leave the parking lot without paying. We were truly disappointed with our experience at the hotel, but we did not let it ruin our vacation. We will not be staying here again. Excellent free breakfast every morning. Room was large and comfortably fit 6 people. A little out dated. Pool but not hot tub. Good customer service. We chose the Clarion because it was a good deal and close to Disney. But this hotel is in desperate need of some upgrades and they need to give more attention to cleanliness. The room we were assigned to was directly over the main entrance. It was so noisy, the sliding glass door did not shut all the way, there were crumbled chips and a water bottle under the side of the bed, the beds were horrible uncomfortable. We requested a room change, so they moved us to the other side of the hotel that was less noisy, but the side the sun was on. The AC did not work, and made the whole room smell like a burning toaster. Once again the beds were horrible and there was taco sauce and a sock left in the room. The whole thing is pretty out dated and really needs improvements. The ceilings are falling apart, they had water leaks in the lobby, there huge cracks in the walls and the rooms stink from the AC units. The only good thing I can say about it, is the employees are friendly, but we will never be staying here again and I would never recommend it to anyone. we made our breakfast the best part of the day much to choose from and change the platters and options every other day and took goodies 2snack on 4the kids later on(bread pbj). the hotel is old but is a very kind group of people working there we went 2the bar room w.the kids late night and had rootbeer floats our waiter was anotnio he was amazing and kind the kids are still talking about this guy 3yrs later im absolutely planning every 3yrs visit staying at the clarion in the future the shuttle was worth the price 2be in AC b4 and after walking the parks but close enough you could walk if ur up 2it i recommend the shuttle tho .and they give you freebies at the front desk for whats left behind deodorant toothbrush sewing kit etc.and the pool was relaxing enough for the kids.we stayed in the suite and it was nice ,average but clean . I have been staying at the Clarion for a couple years now. The service is fantastic, including the cafe. Best value all the way around! Won't stay here ever again! We booked 2 rooms for 2 different families. When we booked this motel it said "one block from the entrance." That is absolutely NOT correct. It is 3 1/2 CITY BLOCKS from the ENTRANCE to Disneyland, which takes 25-30 minutes to walk (at a decent pace). Because the walk was so much farther than we expected we talked to them about their shuttle. They charge $5 a person per day. Crazy ridiculous. We booked with the free buffet breakfast, which was sub-par at best. The eggs were slimy, the toast was so hard it was inedible, and there wasn't a huge selection. I would have been happier with any other CONTINENTAL breakfast we've had staying anywhere else over this garbage. Our heater did not work, and for once in SO CAL it was COLD and very rainy. The other rooms curtain rod was bent and the shower curtain would slip to the center and it allowed water to go everywhere. It had obviously been an ongoing issue with the mold/deterioration of the floor and wall. The bathroom sinks didn't drain worth a crap. The toilets would't flush properly and you had to flush 4-5 times in order for your poop to flush (sorry, probably TMI but it's true!). The beds were HORRID. We booked 2 standard plus pull out sofa bed. The sofa beds were absolutely USELESS. The mattresses were so bad there was literally a sunken hole in the center, making sleeping impossible. Therefore, 3 kids had to cram on a double bed. That made for long, sleepless nights, which led to not so much fun days in the park with little kids. It was dirty. The floors. The walls. The elevator. The laundry room. I could go on and on. We have stayed at 5 other hotels (within the last years- 2 of which were through Get Away) while visiting Disneyland and have never felt so compelled to write a review. Those stays were decent and those hotels, although had faults, were pleasant enough to stay in again. I'm disappointed that Get Away Today has partnered with such a terrible hotel. We will NEVER stay here again and would recommend others find another place to stay as well. We had 3 adults and a 16yo Girl. The mini suite worked great for us. Our room was clean and quiet even though we had a room next to the elevators. Breakfast was good. We will stay here again. Our room looked clean from first appearance, however the bathroom was filthy upon closer inspection. The shower curtain rod broke and almost fell on my head, and the hotels hair dryer caught on fire as i was using it. It may be a cheaper choice to stay here, however its not worth saving the extra few dollars. Great value and the breakfast is way better than your average continental. You get placed at a table with a server that will get your drinks and clear your table. A nice touch and the servers were nice. Upgraded to a "Suite". I can tell that they have recently put some effort into upgrading the "living portion" of the room and I give that a solid 4 ... but the bathroom is outdated, the sink is small, and the water pressure and drainage were poor. In all the hotel is currently a 3-3.5, but could easily be at a 4 with a little TLC and updating to the bathrooms and water pressure/drainage. But a big 5 for the value and proximity to the park! Wall outlets, would not hold your plug in. When you pulled your plug teeth out to give a snug fit, your charging brick would get real hot. Some outlets were hot on top but not on bottom. So you were not charging your phone when it was plugged in. The sliding window lock was not screwed in tight to the frame. So you had to hold one piece to push the locking part into the hole. The door latch/lock did not even lock at all. The bath tub shower pull did not have a top piece to hold on to. So pulling that piece up was difficult. Had to use a hand towel to get a grip. AC unit 2 floors up was leaking on to our balcony. It looked like it was raining outside. It was coming down so hard, we had to close the sliding door because everything was getting wet. The drapes were frayed at the edges. The bathroom door shut and you could lock the door but the door was still able to open. The elevators were extremely slow. expected much better coming from Clarion . The staff was very nice. The distance was fine to Disneyland and the shuttle worked out great. This hotel was really outdated and old, the rooms were tiny despite being "suites", the beds were really, really small and the room was not very clean.This site says that the rooms were newly renovated but that was not the case for the room I was in which had 2 broken towel bars, tiles falling off the edge of the bathroom mirror, an outlet that nearly came out of the wall and very unclean floors. The restaurant was dirty as well and they took over an hour to bring out dinner despite there being hardly anyone there. Also, the boiler broke so not hot water until after 10pm one night. I would give this hotel a little higher rating on the value, however I wasn't able to get the best deal since the hotel was sold out with GAT, so that is a 1 also. Over all the hotel was just really old and outdated - I wouldn't stay again. room was okay beds were small and bathroom very out of date. shower water pressure wasn't good and the bath didn't plug to take a bath and then the water heater broke. Took the kids to the pool that is outside of the hotel and not heated. We decided to play games in the arcade, they were all old games and not working well. The breakfast was good with variety of foods. We did agree to not spend a bunch of money on the room as we would not be in the room but at Disney. We did not realize that we would be getting such a cheep hotel for what we spent. The rooms were small, and did not smell clean. Did not look as though the floors had ever been shampooed. There was dust on the floors as well. Our trash and towels were not taken out daily or replaced. Dirty cups were not taken out of our room daily either. We were there 4 days, and multpile times had to call the front desk for clean towels, clean bedding etc.. the bathroom looked as if it hadn't been remodeled ever. The bathroom was also very small. I don't know why this room was considered a suite. Also, the walls were very thin, you could hear every word if the person in the room next to you. (We couldn't get one good night sleep!) The last thing was, when we ate breakfast there the first 2 days, the cups were dirty! We went through 4 coffee cups the first day trying to get them to bring a clean one. We finally gave up, and didn't order anymore coffee. The forks had dried eggs on them, and the plates 75% of the time had food on the bottom, or were dirty! We stopped even trying at their breakfast. I was very disappointed and felt as though our money was wasted here! We won't ever stay there again. If I hadn't already prepaid for everything, and we weren't at Disney all day and the hotel just at night, we would have definitely switched hotels! I don't know why is says newly renovated rooms, my room was definitely not renovated! The rooms are small, the bathroom area was way to small, couldn't close the door while using toilet. The beds are also small and crappy. The only good thing about the hotel was the breakfast, it was very good and most of the waitstaff were attentive. Also it was only about a 10-15 minute walk to the park. If we had planned a longer stay to relax at the hotel I would have went to another hotel. I was very disappointed. The room we were originally given was not renovated, smell,, the carpets were really dirty and there was stuff on the ground and everything felt really dirty. When I was spraying some lysol to try and remove some of the smell I pulled the curtain back and there was a cockroach. We called them and they moved us to a renovated room. The room was nicer but the bathroom was not renovated and to me that is an important thing to have renovated because that is the room you get clean. The breakfast was good and the staff was friendly and helpful. It was across the street from the Toy Story Parking lot so the shuttle was free. We chose to stay at the Clarion after we added a couple people to our family trip and they had the best pricing on suites. We knew this meant a room with two double beds and a pull out sofa bed. I grew nervous about our choice after reading recent reviews on TripAdvisor and I called GAT days before our departure. I spoke with a woman who reassured me that the suites had been remodeled and contained all new bedding, furniture, etc. I was sorely disappointed when we checked in to our third floor suite and it was rundown, way outdated, and just gross. The carpet was dirty, some of the furniture had unidentifiable stains, and one of the beds looked like a taco it was bowed so badly. I ended up going to the front desk and explaining my disappointment. An older gentleman, the manager perhaps, could not move us until the following day but put a note in the system that we would be moving to a newly remodeled suite room and reserved it for us for the remaining 3 nights. We explained we would be at the parks all day and would not return until late evening, which he said "no one will be staying in that room". What? LOL He did tell us that only the top 3 floors had been remodeled at that time (Floors 7-9) of our visit. The next evening, after arriving back from the parks around 10:30, we moved to our room on the 9th floor. What a difference! Although the floor plan was much smaller, it was clean and updated. We could even see the fireworks one evening! The updated suite had the counter/sink area outside of the bathroom so that several people could be getting ready at the same time. 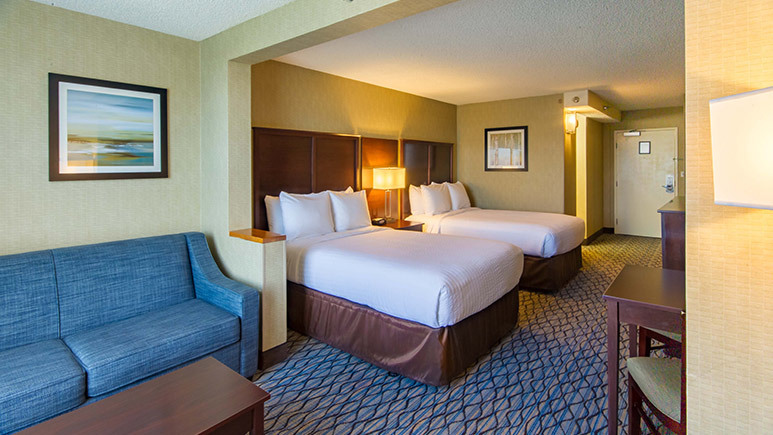 We felt comfortable in the newly renovated room and had no complaints for the rest of our stay. The breakfast that was included with booking through GAT was very good, filling, and the wait staff were very pleasant. I would say that if GAT is to continue partnering with this hotel, then you need to guarantee your clients that they will be in one of the newly renovated rooms or consider not partnering with this hotel. I have booked through GAT on at least 6 occasions and have always trusted that if they partnered with a hotel then it must be good. Our first night at the Clarion was the only time I have questioned GAT's judgment of their partnerships. Checking in was a bit of a chore, they couldn't find my reservation at first and the girl helping me was not very friendly. We also had an issue with the free breakfast since our coupons stated it was only for 2 people per room per day (I booked 2 suites and we had 12 people total). The one suite leaked water from the ceiling continually and we called to report the problem, but no one ever came - the toilet also leaked water continually onto the bathroom floor. The parking lot was a MESS. It was practically empty the entire trip, yet they have signs blocking off entry to the parking lot (which requires a key card - to enter and exit) and all the signs in and out contradict each other (a sign says ENTER ONLY but painted on the ground it says exit and has a large arrow pointing OUT). I had a large SUV and the entry was almost a U-turn and impossible to make while still being close enough to put the card in - I had to get out of my SUV to put the key card in to raise the arm. Getting out was just as confusing I watched car after car drive around in circles trying to figure out how to exit the parking lot since the 'exits' were blocked off and you could not follow the arrows since they lead to the entrance. Although this hotel has a great price, the quality of the room and services were not that great. We got the suite on our vacation and all it was, was a standard room with a pull out couch... a room intended for 5 people had the bathroom connected to the shower, so if someone was showering you couldn't use the restroom. The plumbing was horrible. The outlets in the rooms didn't work, so good luck being able to charge your electronics. When we first checked in the woman at the check in counter had our guest count wrong, my child wasn't on the reservation, which I thought wasn't that big of a deal at first. She then tells me that if we wanted him to eat breakfast we would have to pay $13.95 for him, mind you he is 2. So I get on the phone with Get-Away-Today and explain, and they said they would send over our reservation, which included my son, and then we should be good. About an hour goes by and I go to the front desk and explain everything, and it was a different employee than before, and she tells me that it didn't matter because children 2 and under are free. To most this might not be that big of a deal, but it was aggravating that one employee tried to charge us, and then it turned out we didn't have to! Over all point, you get what you pay for! I chose this hotel because of the great price. I wasn't expecting much, to be honest. A friend of mine had stayed there as well and said it was good for the price. It definitely needs updated, our hair dryer was broken, some of the outlets didn't work well. But the room was very clean and comfortable. There was a cafe with a breakfast buffet as well as a bar that opened in the evening. I wish it had longer hours, but when it was open they had a great happy hour with $5 drinks and $5 appetizers and tacos. The staff was super friendly, and the food and drinks were good. Great way to avoid paying the high prices at the park before you head out. There's also a little gift shop that surprisingly held a lot of stuff, but if you forget something (like toothpaste) you can call housekeeping and they'll bring it up at no charge. Also, you can take a shuttle to the park for a low cost, but it's only about a 10 minute walk. Overall our experience was great, and we would stay here again. I had a very good experience with the hotel friendly staff. I will definitely book through get away today for my next vacation but not at this hotel. The free parking and free hot breakfast were great. The swimming pool was clean and inviting. The ART shuttle was convenient picked us up right in front of hotel. My room was very outdated. Needs to upgrade plumbing for toilet flushing and for the shower. The water in the shower would suddenly turn scolding hot and then turn freezing cold. 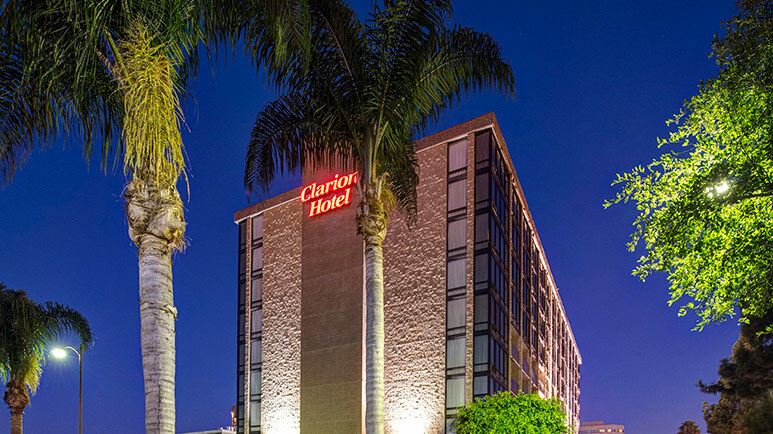 We think the Clarion in Anaheim is one of the best values offered. 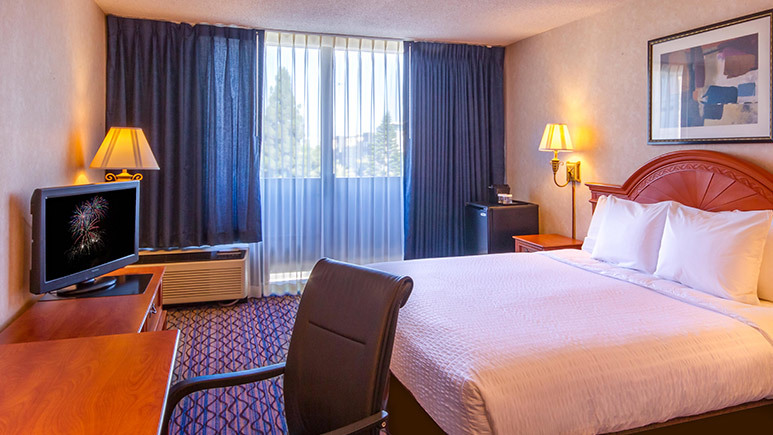 It could use a facelift on some rooms BUT overall it is clean and the breakfast and free parking are a great value. SOMEONE CLAIMING THEY WERE WITH HOUSEKEEPING WALKED INTO ROOM WITHOUT ANNOUNCING WHO THEY WERE. RUDE! The staff needs to be friendly. The room had little things falling apart. Their washer machine was out of service, the vending machines took my coins, my daughter got a prize from the vending machine that was broken. If you are going to spend the whole day out then this hotel is for you, but if you want to be comfortable I would pay a little bit more. The pool was the best part of this hotel. This last trip marks the 3rd time we have stayed at the Clarion. The staff is beyond generous, they have let us check in early (This last time was 9AM and they upgraded us to a suite at no extra cost!) and let us park there after check out. This is key for us since we are a 4 hour drive from Disney, so we come early in the day and leave later at night. The hot breakfast is great compared to some other hotel continental breakfasts. The rooms were clean, and beds were comfy. We had grad night students down our hall and above us, but I didn't hear them at all, it is well insulated. The staff were all extremely friendly and went out of their way to make us feel at home. My family spent 5 nights at the Clarion just a few weeks ago and it far exceeded my expectations. I read some reviews and was a little worried but we had a great stay. The staff was very professional, helpful & friendly. Especially the waiters at the buffet! Our room was clean and the beds were quite comfy. The only thing I saw that was similar to other reviews was slightly outdated bathroom and by outdated I mean just older tile & finishes & the water pressure was very low so it took forever to fill up our toddlers tub but really not a big deal for us! Our family wasn't too concerned about how nice the hotel would be since we were going to be at Disneyland for most of the time but for the time we did spend at the hotel it was very nice & we would totally stay here again. Great for the price!! Thank you Get Away Today for an incredible trip. We will be back. We picked this hotel because it was cheap and had free breakfast and parking. I'd read some other reviews, so my expectations weren't too high. But when we checked in, we were pleasantly surprised. The rooms were new, and were much nicer than I was expecting. We had a great time and I would definitely recommend it to anyone who loves a good deal. For the value, this hotel was perfect for our family! Not only that, but when we checked in, the front desk worker let us know the rooms had just been remodeled which made for such an exciting surprise! When we got to the room, we were not disappointed. If you are looking for a great price, awesome location, free breakfast AND new rooms, the Clarion is for you. We will for sure be staying here again in the near future. We booked a last minute Disneyland trip and didn't want to spend too much on a hotel. I was a little nervous to book the Clarion because of other negative reviews. We were pleasantly surprised when we arrived! The front desk staff was very nice and they upgraded us to a corner suite with floor to ceiling windows overlooking towards Disneyland so we could see the fireworks nightly. The hotel is older but we felt our room was clean. They were remodeling the whole 7th floor while we were there so they are making upgrades. The breakfast was nothing fancy but the kids loved the waffles. The pool was warm and large. Overall if I was on a tight budget I would definitely stay here again. We also walked to Disneyland every day and it wasn't too bad. Great hotel for the price! We stayed here three years ago and we were so happy we came back. Never again! The first room they gave us smelled horribly of smoke so they moved us to another room. At 4 am our smoke alarm went off and the person at the front desk said he was the only one in the hotel so the only thing he could do for us was have us switch rooms or we would just have to listen to it for another thirty minutes. I managed to 'fix' it myself although the whole family was woken up. In the morning I went to talk to the front desk and the girl said she had never heard of anything like that. No apology and no offer to try to compensate us in anyway for being woken at 4am. The bathroom was grimy and it was evident that nothing was wiped down by the cleaning staff. We also found the last guests dirty socks on the side of the bed. Spend a little more money and stay somewhere clean! And the breakfast was not that great. The pastries were hard and the manager said sometimes the staff doesn't take them out of the freezer early enough to thaw. Well they didn't take them out early enough all three days! My experience with Get Away Today was great, but the hotel we stayed at was not. The bathrooms were dirty, the fan did not work, the carpets were severely stained, and the television wouldn't work half of the time. I will use Get Away Today to book another vacation, but I will not stay at the Clarion again. nice affordable room, plus a great breakfast. The hotel was below average. The room was very dated and the bathroom in the room looked dirty. Good price, but not the best quality. We had a wonderful stay. The hotel was very nice and the price was exceptional. Thank you for a wonderful holiday trip! We booked this hotel because it was the cheapest for when we were going to Disneyland. They had a good, free breakfast and the hotel took good care of our family. We ate dinner there one night and they had good food in their little restaurant. The rooms felt a little small, but we weren't there much so it didn't really matter.